Or you can buy all 6 of the above products in The Thunderbolt Collection which offers an additional 10% off, totalling to 50% off the sold separately price. How long is Thunderbolt running for? 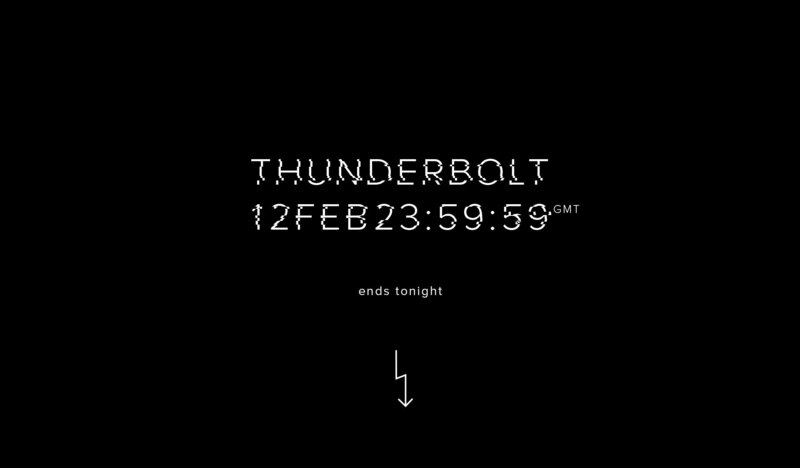 Our Thunderbolt promotion runs from Monday 11th February 2019 until 23:59GMT 12th February 2019. What is the thunderbolt Collection? A collection containing all six Thunderbolt products with an additional 10% off, totalling to 50% off if bought separately. The Thunderbolt Collection includes all 6 of the above products. WHAT IF I ALREADY OWN SOME OF THE PRODUCTS IN The Thunderbolt COLLECTION? Our site will intelligently deduct these at the Collection discount rate. Just log in, add a collection to your cart and let us do the rest. CAN I USE THiS DISCOUNT WITH my 30% OFF EDUCATIONAL DISCOUNT? Unfortunately you can’t combine the two discounts however our Thunderbolt offer is greater than our Educational Discount offer.